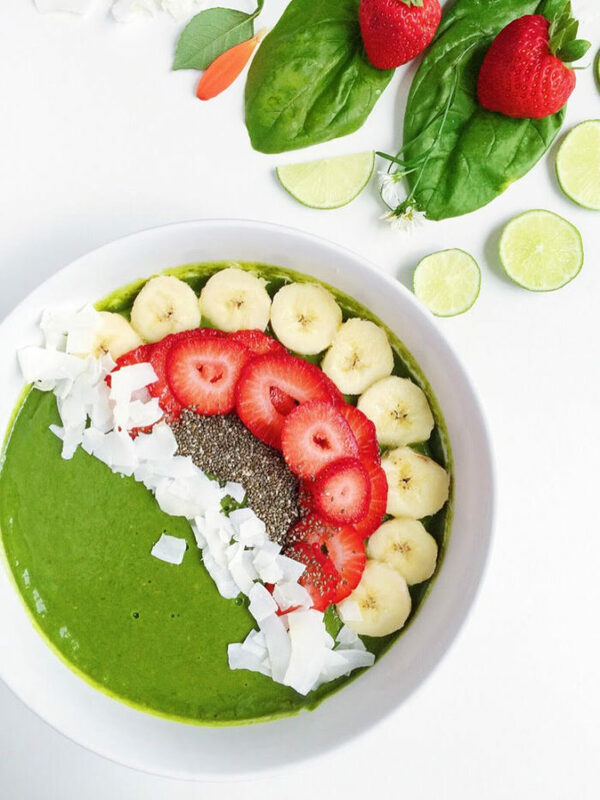 Delicious and healthy vegan Avocado + Strawberry Green Smoothie Bowl is full of fiber, vitamins, and nutrients and a perfect way to start your day! Happy Meatless Monday! (Bonus: I’m the Recipe of the Week over there!) As always, I’m honored to bring you a delicious, accessible, and meatless meal every Monday. Thinking about joining in on this awesome movement? You should! I talk all about the benefits here and here. 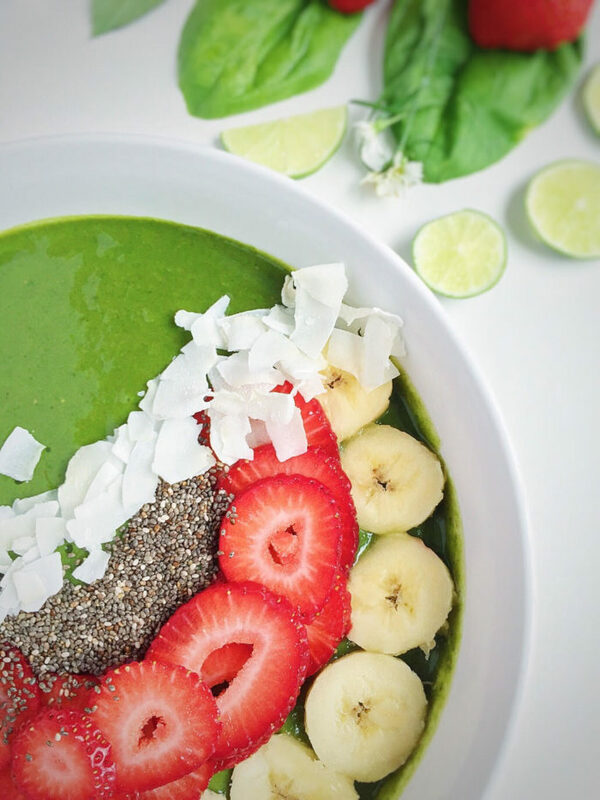 This Monday, I’m bringing you a super simple and delicious Green Smoothie Bowl. 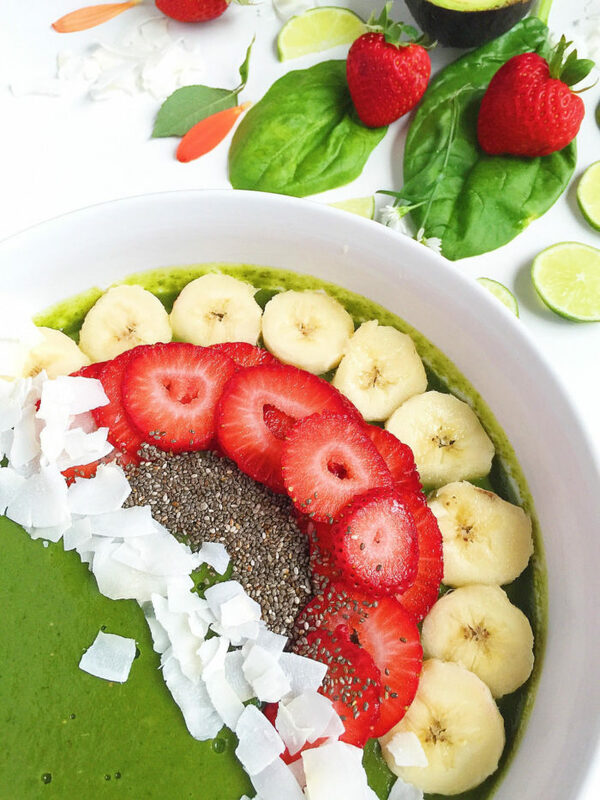 This smoothie bowl is made with avocado, strawberries, spinach, kale, and coconut water. 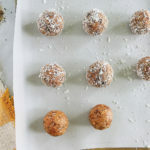 It’s vegan, dairy-free, and crazy easy to make. 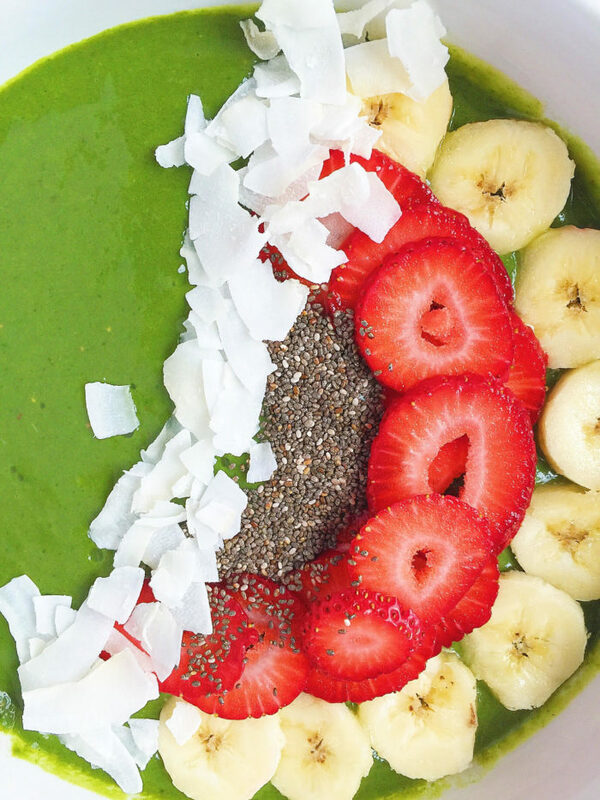 Why make a smoothie bowl when you can just drink a smoothie? It’s really all about the toppings. 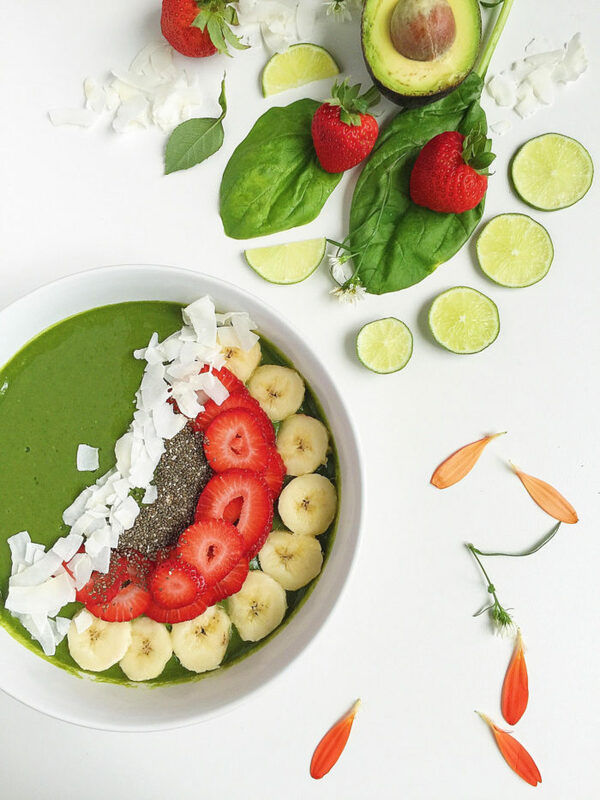 Smoothie bowls are definitely more filling and can really feel like a more complete meal. Plus, they’re totally trending right now and you can be a star among your Instagram friends! They’re just so picture-worthy. They’re made the same exact way as a smoothie, just a little thicker, and eaten with a spoon instead of a straw. But, yeah, they’re all about the toppings. And really, you could top them with just about anything. Cocao nibs. Or chocolate chips. We don’t care. Go nuts. A drizzle of honey or maple syrup. The world is your oyster bowl. 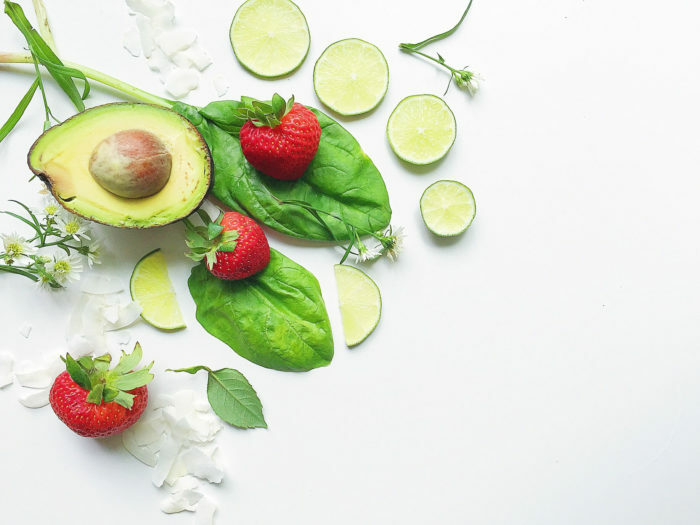 I like this recipe particularly because although it’s a green smoothie and packed full of green goodies, it also has strawberries and banana to give more of a fruity sweetness. Kale and spinach make up the “green” portion of this bowl, delivering a large dose of fiber, vitamins, and nutrients. Frozen strawberries and bananas are a must for creating the thick, dreamy texture. 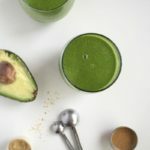 Avocado gets on board by providing some healthy fats in addition to coconut oil, and coconut water keeps this smoothie dairy-free and light. There you have it, my friends! 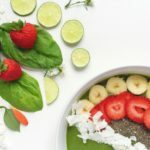 What are your favorite smoothie bowl toppings? Do you prefer your smoothie in a glass or in a bowl? Tell me in the comments below! 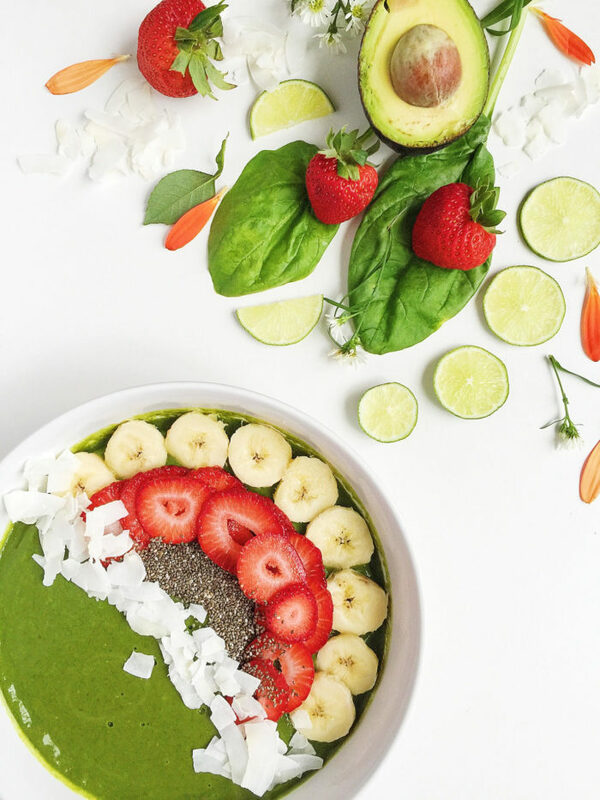 Enjoy this delicious Avocado and Strawberry Green Smoothie Bowl for breakfast or a healthy snack. 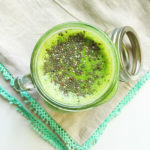 It’s full of fiber, vitamins, and nutrients, and sure to keep you fuller than your average smoothie! Chia seeds, unsweetened coconut, fresh strawberries, and banana slices. Blend all ingredients in a high-speed blender until smooth. 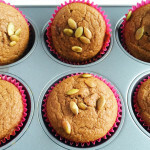 If using the coconut oil, melt it gently until slightly warm but not hot and drizzle in with the blender running. The smoothie should be thick due to the frozen banana and berries. If you would like to thicken it more, add ice until your desired consistency. 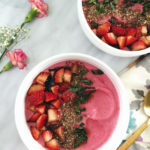 This avocado Strawberry smoothie bowl is so beautiful and super nutritious! What a great start for your day! Pinning and stumbling! This looks so so so delicious! And the pictures are beautiful! Great recipe, Tiffany! 🙂 Bananas and spinach are my all-stars. Avocado not so much. But this recipe looks good so I can give this a try. Thank you, Johnny! You may be the first person I’ve ever met that doesn’t like avocado! lol 🙂 Bananas and spinach are my favorite, too. I pretty much never make a smoothie without them! Nom Nom! 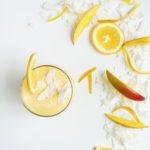 This looks so good, especially on a hot summer day. 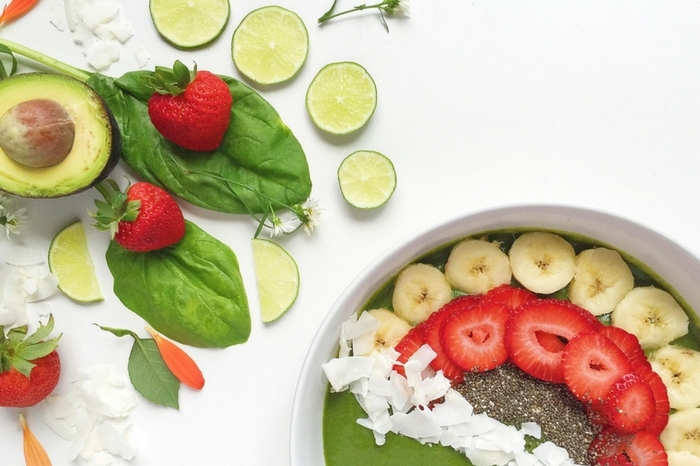 Smoothie bowls are awesome! I continue to enjoy your posts, your yummy food, and your beautiful pictures. Your photos are always so colorful and alive! Thank you for introducing me to smoothie bowls. They are so good! I love kale and spinach and love this recipe.